When Spring Festival approaches, fishermen in Shitang town of Wenling in Taizhou, Zhejiang province are busy making tangjiu (糖龟/糖阄) to celebrate the festival. 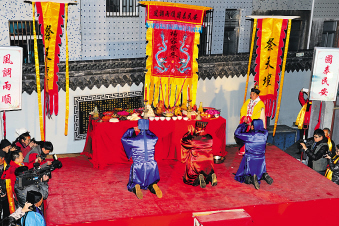 The ancient festivals and customs of the Linhai culture reflect the history of Linhai in Taizhou, Zhejiang province, something like living fossils. In ancient times, the titles of Marquis and Duke were granted to Guan Yu posthumously who was then called Guandi (Emperor Guan) or Guangong (Lord Guan) by followers, and worshiped in temples scattered everywhere. According to traditional marriage customs in Tiantai county of Taizhou, Zhejiang province, in the first step of a marriage, a boy's family and a girl's family, under the negotiation of a matchmaker, exchanged letters bearing the dates and hours of their births. 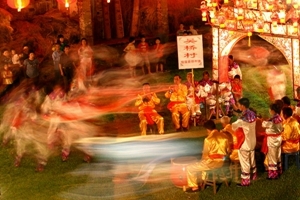 According to traditional marriage customs in Yuhuan, a county-level city of Taizhou, Zhejiang province, in the first step of a marriage, a boy's family and a girl's family, under the negotiation of a matchmaker, will exchange birthday letters bearing the boy's and the girl's birthday and birth hour respectively. Customs and etiquette of marriage, giving birth, birthday celebrations, funerals, house building and house warming in Taizhou. The Winter Solstice is among the twenty four solar terms of the Chinese lunar calendar, created by farmers in ancient China.